Are you a water operator in Virginia who is needing to complete contact hours of training in order to be permitted to renew your license? 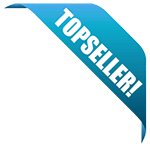 Well, you have found the one-stop location for continuing education training courses that will help you complete those contact hours while also giving you a solid and comprehensive education. What are the CE requirements for Virginia water operators? Of the total 20 hours required, a minimum of five contact hours pertaining to utility management is required. A 20 Contact Hour CE Package for Virginia Water Operators. Includes: Surface Water, Source Water, Coagulation, Sedimentation, Disinfection, Corrosion, Oxidation and Membrane Processes. An 8 Contact Hour CE Package for Virginia Water Operators. Includes: Surface Water Treatment Plant Operations, Corrosion Control and Membrane Processes. 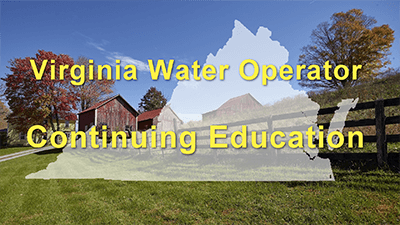 This course provides the 5 hours of continuing education on utility management required to renew a Class 1 or Class 2 waterworks operator's license in Virginia. The class covers two of the seven approved topics that satisfies this requirement: Waterworks Management & Security and Safety Procedures, and is intended to enhance the student's ability to apply enlightened and effective management techniques, prepare and Implement a risk management plan; identify workplace hazards; respond to workplace injuries and illnesses, and to foster a culture of safety able to identify and mitigate hazards at water/wastewater treatment plants. This course will fulfill 4.5 of your required hours for Virginia water operators. A 4 Contact Hour CE package for Virginia Water Operators. Includes: Advanced Oxidation & UV Disinfection and Membrane Processes. This course will fulfill 3 of your required hours for Virginia water operators.